Here's a pair of images from the Bahamas, taken by Flickr user e_mcarthur89. 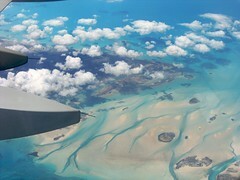 The first image shows the northern tip of Andros Island, the largest island in the Bahamas. The image looks southwest across islets and reefs to the island's tip, at right-center. 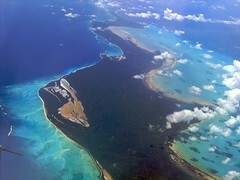 The next image provides a great view of Acklins Island in the Bahamas. The image looks southwest towards the southern tip of the island, visible at top center. Just off the tip of the island, obscured by clouds at the top of the image, is Castle Island.